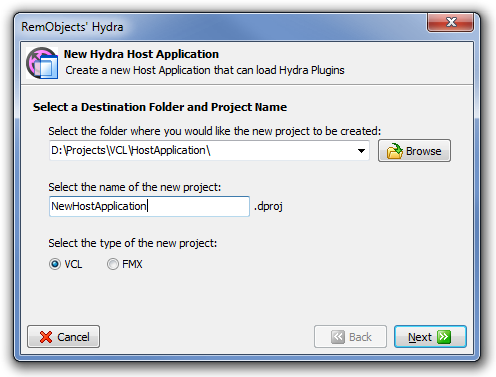 Hydra comes with a couple of project templates that help to start a plugin or host projects. You can start the new host wizard by selecting the Host Application option. The wizard allows you to choose between FireMonkey and VCL frameworks. To start the plugin module wizard, you need to select the Plugin Module option. The New Hydra Module Project wizard will start and you will be presented with a Welcome screen. As you can see, the wizard allows you to choose between FireMonkey and VCL frameworks; to create a VCL plugin module, you will need to select the VCL option. You can choose a name for the controller and (by checking the Configure Advanced Options) set up its data. These pages allow you to set module controller data like a name or a description. These settings are optional and can be changed later in the project. If all settings are to your liking, press the Finish button and the wizard will create a new Hydra plugin module and add a new module manager to it. 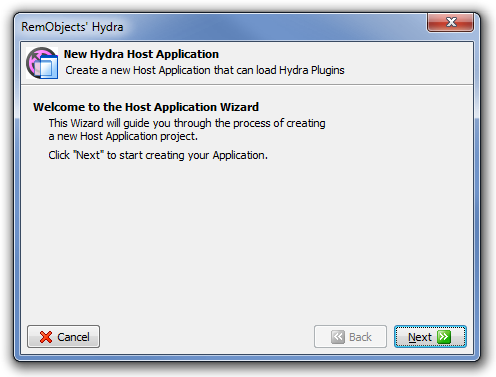 After the new plugin module is created, it will automatically start the New Hydra Plugin wizard that will allow you to create a new plugin. 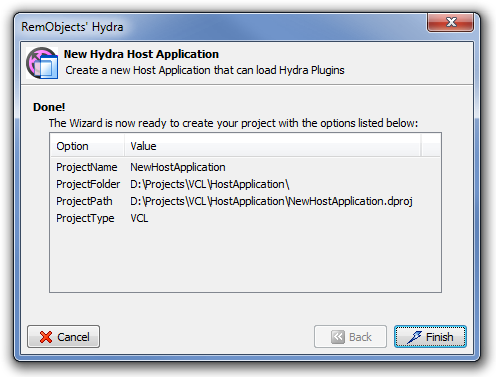 You can launch this wizard anytime from the IDE menu File -> New -> Other by selecting the RemObjects Hydra category and the Hydra Plugin item. The wizard allows you to create three different types of plugin. You can also set the plugin version and additional options by checking the Configure Advanced Options. The advanced options pages are exactly the same as in the New Hydra Module wizard. They are optional and can be edited anytime in the project. It will then add a new file that contains the visual plugin.